It’s no big secret that I love football season. When you are a Husker fan, it’s more like a religion. I suppose it is that way for college football fans all over the US. You wake up early on game day, you pack your cooler full of snacks and adult beverages. You head to Lincoln about 6 hours before kickoff to revel in the whole tailgating experience. You double check, then you triple check that you have your tickets on your person at all times. You get dressed in everything red & white (and/or black here in Husker Nation to pay your respect to the amazing Blackshirts – that would be our defense stars if you are of another religion), even down to wearing team color underthings. Not that it really matters, but you have to show true team spirit. If you don’t feel you are representing the Huskers well enough with all that, then you begin to accessorize. Hats, shoes, jewelry, purses, socks, hair-ties, beverage containers, flags, banners, scarves, gloves, face paint …all must be team color coordinated. 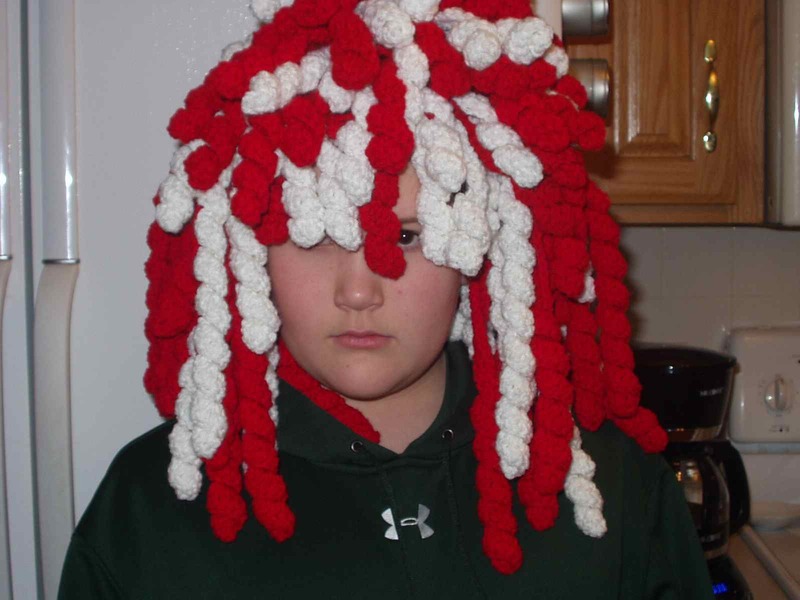 For those of us that crochet, we make dreadlocks. Yes, really. 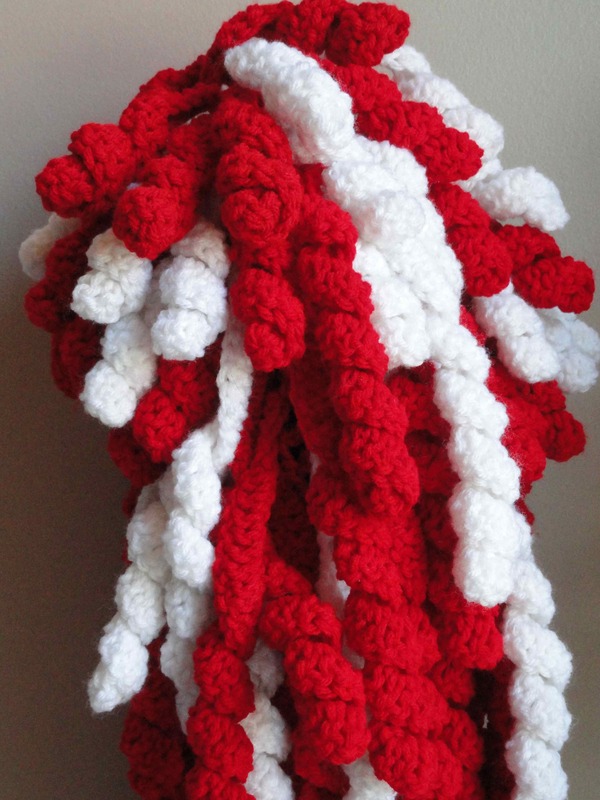 I made Husker Dreadlocks. Memorial Stadium here I come. I was raised to hate the Huskers (CU Buffalos)… but, since I haven’t lived in CO for decades, the hatred has faded into indifference and, as such, does not inhibit my appreciation of all those spirals. 😉 That must have taken awhile! I’m so glad you will overlook our basic differences 🙂 I’ll try not to be the ‘obnoxious Husker fan’ too much! Hi. Is there a pattern for this? I really don’t have a pattern for it. 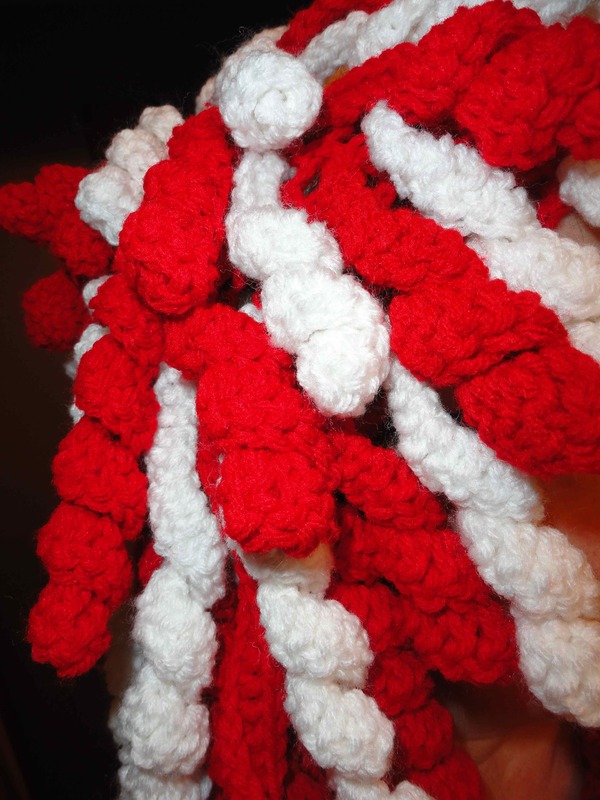 I just made a mesh beanie, and then created a BUNCH of curls in about 4 lengths and tied them all on.